Supporters of the nuclear deal hold posters advocating for the peace the deal will bring. Image taken from the #SupportIranDeal Facebook page. A group of ten to fifteen people dressed in Israeli Defence Force (IDF) t-shirts and waving Canadian, Israeli and IDF flags slowly encircled a large group of Iranians holding posters reading “#SupportIranDeal” and “we choose peace”. The Iranian group was just starting to coordinate their August 15 rally, passing out flags bearing the #SupportIranDeal logo of the dove and olive branch, and creating large posters. This was in Toronto, one of hundreds of locations staging a rally in support of the nuclear agreement between Iran and the P5+1 signed on July 14. The approaching crowd had posters carrying messages such as “Unmask Obama. Obama for Caliph. This is Creeping Jihad” and “Those who ignore history are doomed to repeat it”, juxtaposing images of the Iranian nuclear negotiations with Adolf Hitler and Neville Chamberlain signing for appeasement in 1938. They approached the Iranian dove and olive branch crowd chanting “stop the terrorists” and “they are murderers”. 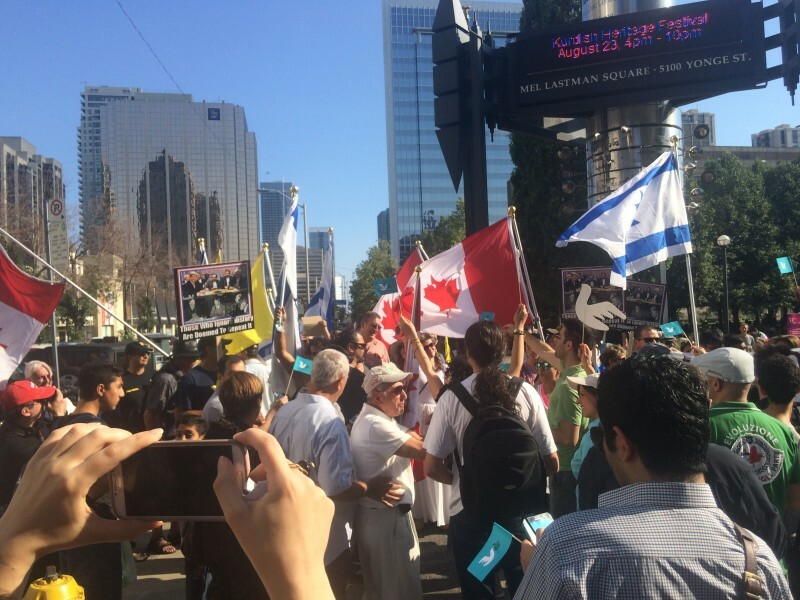 Anti-deal supporters waving Canadian, Israeli and IDF flags encircle the start of the #SupportIranDeal rally in Toronto. Photo by author. The police eventually stepped in to place a barrier between the opposing sides, but not before the Iranian crowd started chanting “peace, peace, peace” in reaction. This was just a small kink in one of over a hundred similar events taking place worldwide on Saturday. 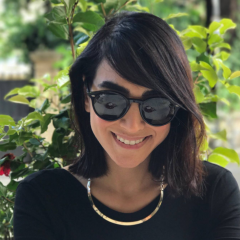 According to a press release posted by the journalist Negar Mortazavi on the #SupportIranDeal Worldwide Facebook page, the grassroots-powered events were formed largely in response to increasingly vocal opposition to the deal. 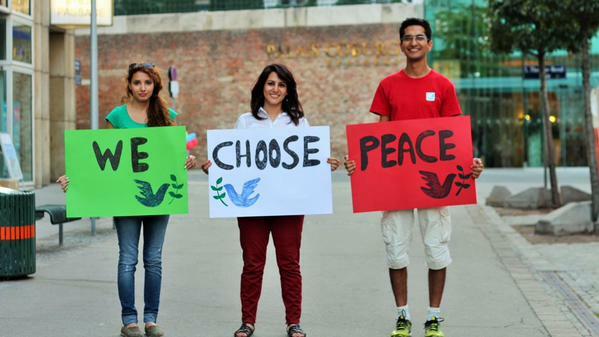 On August 15th 2015, Global Day of Peace for Iran, thousands of people are gathering in cities across the world to show support for peace and prevent another war in the middle east. This is a grassroots movement organized by dozens of volunteers in over 100 cities in 20 countries in 4 continents. Hundreds of volunteers, with no affiliation to any organization or group, have joined this grassroots movement. Thousands of volunteers all around the world are gathering to show support for the historic nuclear deal with Iran, which will make the world and the Middle East a safer place, give Iranian civilians a relief from harsh economic sanctions, and allow for resumption of peaceful relations between Iran and the United States. This is happening while pro-war lobbies in the U.S. are spending millions of dollars on campaigns to kill this deal and the prospect for a sustainable peace. In the weeks leading up to the event, the event's logos and slogans were being distributed widely by supporters. In the Iranian government, Massoumeh Ebtekar, Vice President and head of environmental protection in the Rouhani administration, posted a link to the event's Facebook page. Ebtekar called to support the deal in the face of opposition from inside the U.S. congress and “Zionists”. Did any of these people actually read the deal? Everyone would like to see a peaceful resolution between the west and Iran, if they would read the details of this deal, there isn’t anything in it for westernized countries, the only beneficiary is Iran, they stand to receive upwards of 150 Billion dollars from frozen accounts and once again be able to peddle their crude oil in the open market. If Iran was a peaceful country with peaceful leadership the world would embrace this resolution. Nowhere in this deal does it restrict Iran from continuing supporting terrorist groups like they have for decades, and their leaders will not promise that will not happen, Recently Hezbollah made a statement saying Iran has no plans to stop funding that organization, surely you all remember Hezbollah, right? A good example of Iran’s future intentions to comply with the west is their response to the 2007 United States Supreme Court judgment against them (Peterson vs. Iran) for 2.65 billion dollars, basically their response was “we don’t care about your court system”. President Obama is well aware of this judgment and has made no mention of it, sadly, nor has the media. Well, I have to say that if you think for a second that the U.S. does not support terrorism through proxy groups in the middle east then you have another thing coming. Jundallah proxy in Baluchestan near the Iran -Pakistan border, the MEK who is originally from Iran and yet sided with Iraq during the 8 year war which was supported by the U.S. It’s time to take the tail between your legs out and come to realization that only the wise get others to do their dirty work for them.